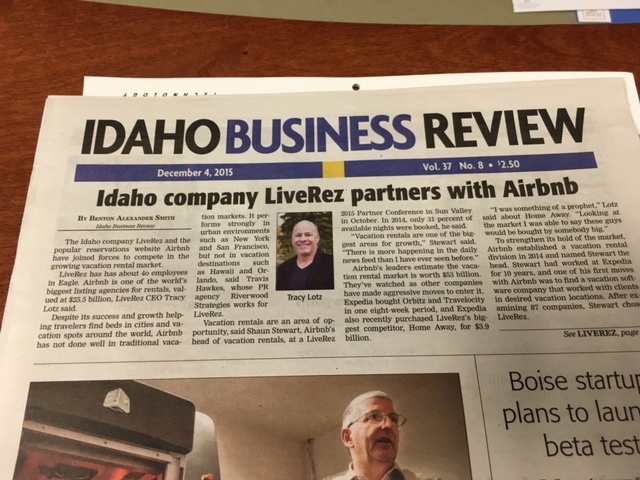 Just last week, the Idaho Business Review published a front-page (top-of-the-fold) story on LiveRez's integration with Airbnb. Among other things, the full-length article details how Airbnb selected LiveRez ahead of the 87 other vacation rental software providers it researched to pilot its expansion into the traditional vacation rental market. This is the second front-page story the publication has written on LiveRez in the past few years, and one of many the Idaho Business Review has published in recent years. To read the story at the Idaho Business Review, click here (or view the PDF Version). And to the see the latest news and coverage of LiveRez, visit LiveRez.com/press.